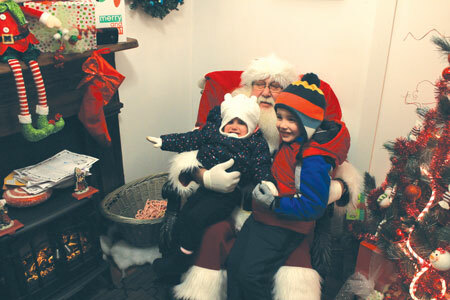 Addison, left, and Lucas Conley sit in Santa’s lap at the Marysville Christmas Walk earlier this week. Local children will have several chances to ask Mr. Claus for Christmas gifts this holiday season. Santa will greet children at his Partners Park village Dec. 6, 13 and 20 from 5 to 7 p.m., and Dec. 8 and 22 from 10 a.m. to noon. Marysville’s Christmas parade through the uptown streets will take place at 2 p.m. Sunday.